It has been many weeks since I posted a vase for Monday as I really do not have much of anything in this garden. Today however I do, hence the hoorah. I have snipped two very precious blooms to share with you, precious not because they are rare or special varieties, rather they are precious because they are blooms that survived the rather rough carriage from the old garden to the new. They remain in the pots that were used to transport them but will be getting to settle into a new patch very soon. The daylight is very grey today and despite my best efforts, the colour is not a true reflection of the flowers. The paler bloom, name long lost, is really a rather fresh green and the mauve one is actually a pink grey tone. For those that are interested in such things, the little hand painted blue jug is only about 8cm and came from the Isle of Wight. I have had it for over 30 years as it was an engagement present from a family friend and neighbour, Sue. So maybe not the most impressive little picking today, but something! Thanks Cathy. I wrote the post without my glasses, who am i kidding! I need them! Well I have added the colon to my page and hope the link works now. Your post looks so pretty today. D.
Your photos are lovely, I can imagine the real life colours and I love the little vase. 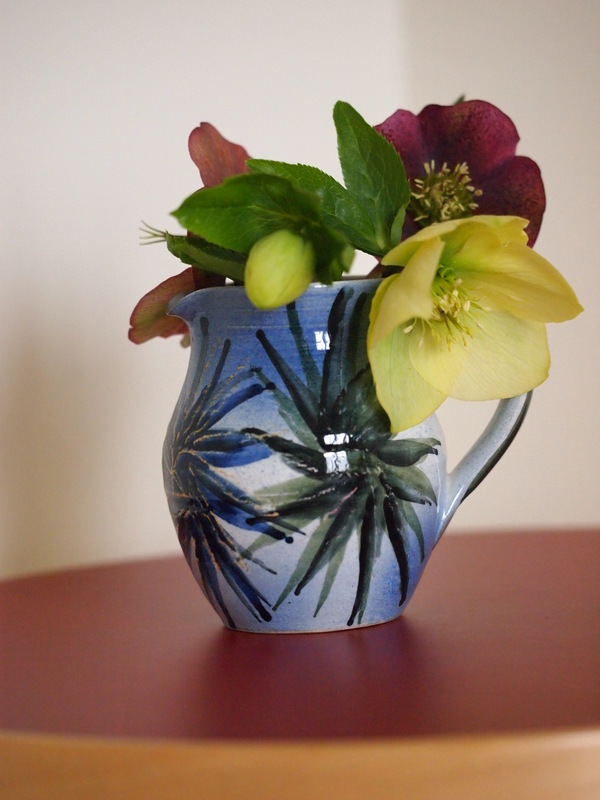 The hellebores in your special vase look lovely. I think of plants I’ve moved around with as especially good friends, so can appreciate that your hellebores survived the trek. That is a good way to think of those plants we gardeners take with us. I like that idea and shall adopt the phrase from now on. Splendid vase, thanks for sharing! Thanks, I have just taken a look at yours and it is mutual admiration! 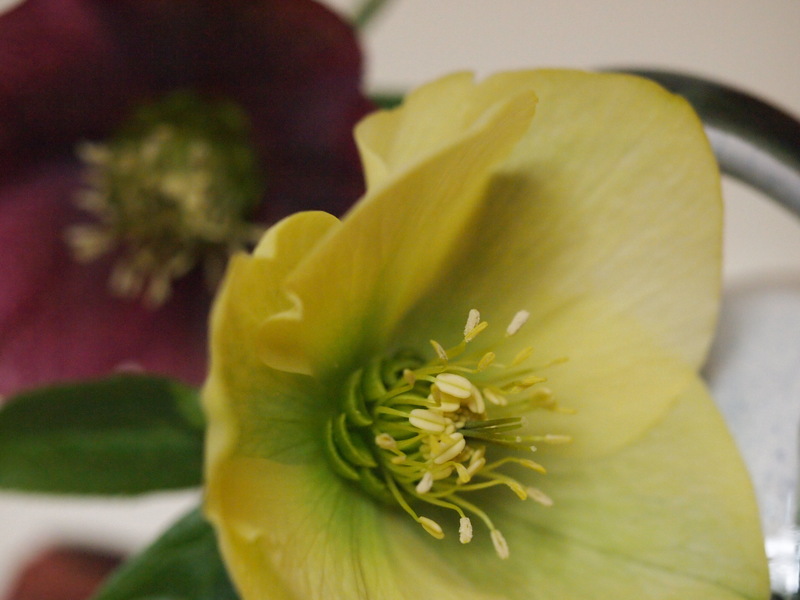 I am very envious, everyone has Hellebores except me! 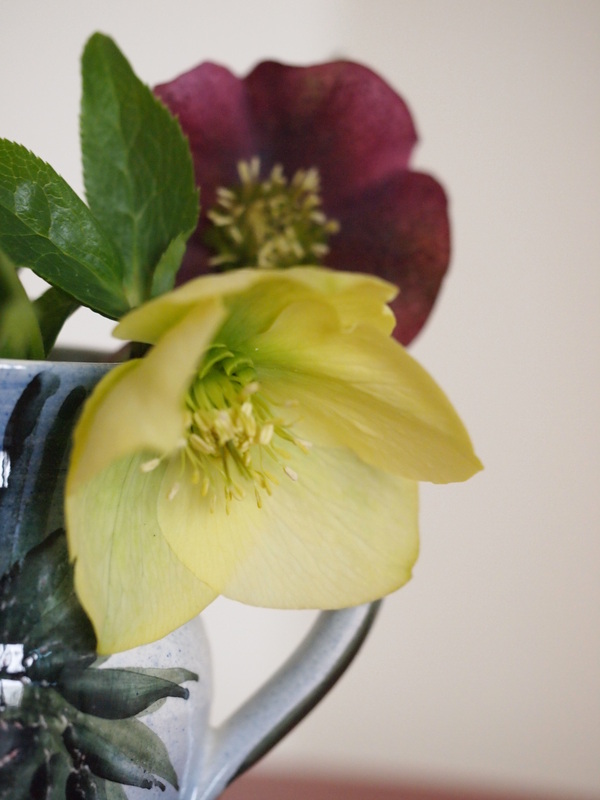 Lovely to have hellebores for a vase. They are a joy. Your vase is so pretty. Thanks Chloris and always good to hear from you.